Location: Ovens in County Cork, Ireland. 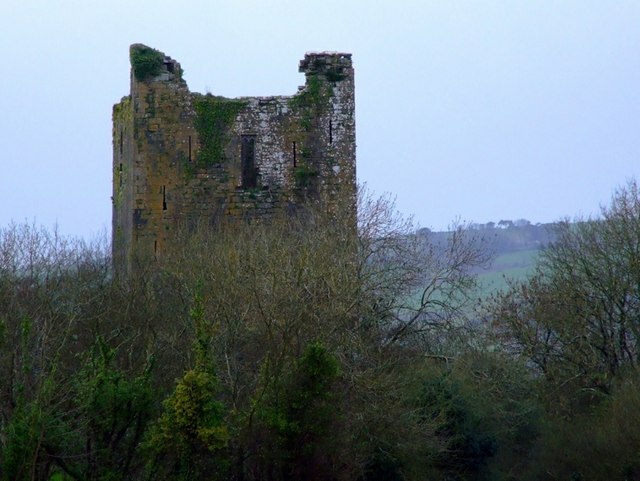 Notes: Kilcrea Castle is a ruined 15th century towerhouse and bawn located to the west of Kilcrea Friary near Ovens in County Cork, Ireland. The ruins are mostly hidden by a thick copse of trees. Unlike the Friary, which is owned and maintained by the National Monuments Service of Ireland, the ruins are on privately owned lands, the land immediate to, and including the ruins themselves, currently serving as a cattle farm. The castle is listed as a Protected Structure by Cork County Council.The castle was completed by 1465 by Cormac Laidir Mór (or More), chief of the McCarthy clan and builder of Blarney Castle and Carrignamuck Tower House, in a marshy area over an old fort possibly dating to the bronze age. The overall structure was built facing north (towards the River Bride), with the main five-story tower house on the western side and the bawn on the eastern side towards the friary. The remains of a three-story tower anchor the southeast corner of the bawn. Text from the 1840s state that the bawn was enclosed with two square towers, however any physical evidence of a second tower on the bawn is lost to the undergrowth. In the mid-19th century a cutting of the now disused Cork and Macroom Railway line was built through the moat of the castle on the northern side.